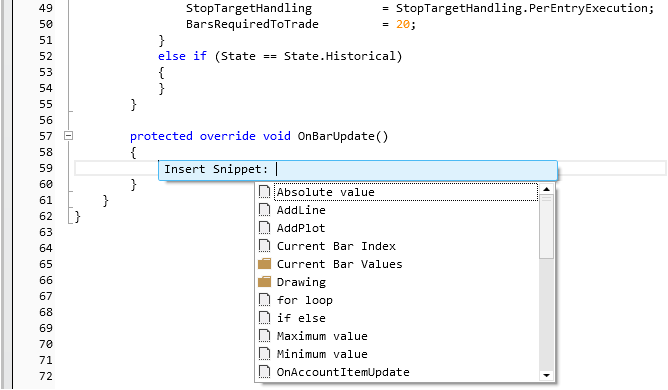 Code Snippets can provide you with useful code templates to speed up your coding process. •Clicking on your right mouse button and selecting the menu name "Insert Code Snippet"
Enter the text in the left column and press the "Tab" key within the NinjaScript Editor. 1. 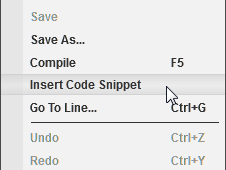 Right mouse click in the NinjaScript Editor and select the menu name "Insert Code Snippet"
2. A menu will display all available code snippets.